Skin Care, Bath & Body. Butler Vermeer Black Bone Inlay Serving Tray, Black - 3865318. This Product Is On Sale For A Limited Time! Product Code: BU3865318 Stock Status: In Stock & Available. Shop Our Store With Confidence! 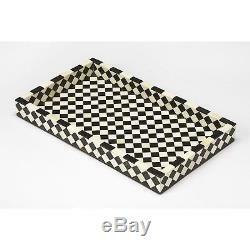 Product Features: Serve food and beverages in style on this rectangular black and white checkerboard serving tray. Expertly crafted from mango wood solids, it features bone inlays contrasted against a black background with a modern aesthetic. Made of Mango Wood Solids, Resin, Bone Inlays. Part of the Hors D'oeuvres Collection. Overall Dimensions: 12"(D) x 20"(W) x 2(H). We are a Boston-based store dedicated to providing you the very best products at the lowest possible prices while delivering the absolute best in personalized customer service. Our award winning service isn't the only reason you'll shop with us. Our goal is to provide you with a huge selection and the freedom to choose from only top quality products, without overwhelming you with poor value options. Sifting through thousands of products can be daunting, confusing and frustrating! We have hand-selected our catalog to meet a variety of design styles across a wide range of different prices to suit all of your home furnishing needs. The item "Butler Vermeer Black Bone Inlay Serving Tray, Black 3865318" is in sale since Wednesday, July 12, 2017. This item is in the category "Home & Garden\Kitchen, Dining & Bar\Dinnerware & Serving Dishes\Trays". The seller is "shop_freely" and is located in Multiple Locations. This item can be shipped to United States, Canada, United Kingdom, Denmark, Romania, Slovakia, Bulgaria, Czech republic, Finland, Hungary, Latvia, Lithuania, Malta, Estonia, Australia, Greece, Portugal, Cyprus, Slovenia, Japan, China, Sweden, South Korea, Indonesia, Taiwan, South africa, Belgium, France, Hong Kong, Ireland, Netherlands, Poland, Spain, Italy, Germany, Austria, Russian federation, Israel, Mexico, New Zealand, Philippines, Singapore, Switzerland, Norway, Saudi arabia, Ukraine, United arab emirates, Qatar, Kuwait, Bahrain, Croatia, Malaysia, Brazil, Chile, Colombia, Costa rica, Panama, Trinidad and tobago, Guatemala, Honduras, Jamaica.